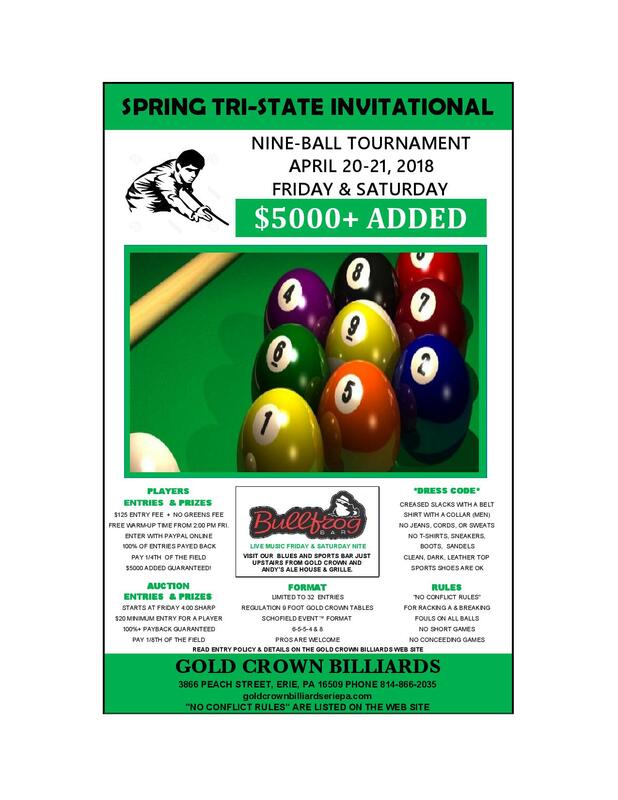 Friday night, and Saturday, April 20th & 21st are the dates for the 9th Annual Spring Tri-State Nine-Ball Tournament. The added funds will be $5000 regardless of number of entries. The field will be limited to 32 players. The players meeting will be at 4:00 and all players are required to be present. A player auction will follow. DETAILS: The entry fee is $125. There is no greens fee. Everyone should read the Late Player Policy at the link below. There is a dress code described on the flyer. Game rules are also detailed on the flyer. FORMAT: The format is the same format utilized over the last five years. Our standard 32 man quadruple elimination preliminary bracket (6-5-5-4) will move 8 players forward. Those 8 players will then play in a 8 man single elimination championship bracket. The quarter-finals, semi-finals, and finals will be races to 8. SCHEDULE: The players meeting is at 4:00 and play will start shortly after 6:00 Friday night. Everyone will play at least 2 matches and should conclude around 11:30 or so. Play will resume at 10:30 Saturday morning. The preliminary rounds should wrap up around 5:00 Saturday afternoon. The 8 remaining players will all receive prize money and will resume play in the Championship Bracket at around 6:00 Saturday Night. The bracket should wind down sometime around 11:00 Saturday Night. PLAYER ENTRY RULES: Past winners are guaranteed a spot until March 26th. Top 100 ranked players have priority behind past winners. Factors considered for all other spots awarded are participation frequency, Break-Count Average, and tournament resume’. All entries must be in by midnight Monday, April 16th. The field will be announced Tuesday online at 1:00 in the afternoon.